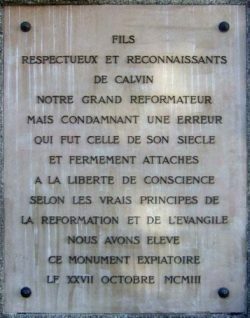 A generation after Luther, the Frenchman Jean Calvin became the organiser of the Reformation : he organised the Church, shaped the doctrine and defined the role of the Church in state government. Jean Cauvin or Calvin was born in Noyon in the Picardie region. He was the son of a property administrator working for the Noyon canons and of a pious Catholic mother who died at an early age. Calvin received a scholarship from the Church, making it possible for him to continue his studies in Noyon. Later, he studied in Paris, at the La Marche and Montaigu schools. His father had planned that his son should take holy orders but quarrels with the Noyon canons made him orientate his son towards law studies. 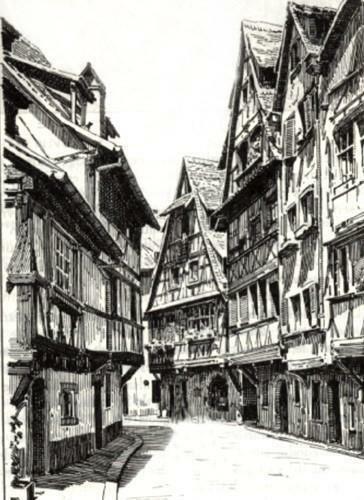 Calvin studied law in Orleans and in Bourges where he had access to the best masters of his time. Law studies had a lasting impact on Calvin’s though. Unlike Luther, he always considered law in a positive way. After his father’s death, he became interested in theology and humanities. His first book was a commentary on Seneca’s De Clementia. He had frequent contacts with humanistic and theological circles engaged in the debate of new ideas. He studied Greek and Hebrew. 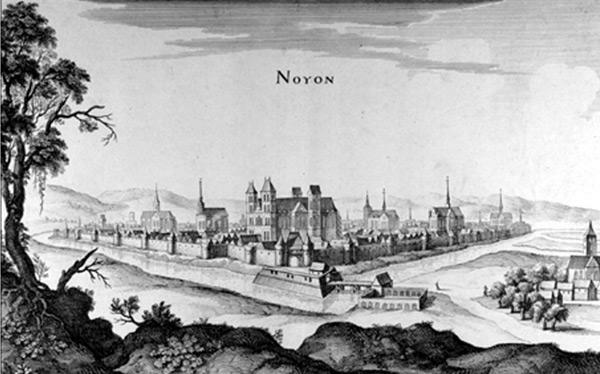 Noyon in the 16th century © S.H.P.F. His conversion may go back to 1533 but this remains uncertain. In 1534, he broke away from the Catholic Church and renounced to his scholarship. That same year, he travelled a lot : to Angoulême, to Orléans, Paris, Nierac, and Noyon. Calvin was in Paris when the “posters incident” broke out. During the repression, he left France and took refuge in Basel where he continued his theological work. His first dogmatic text is the introduction to the translation of the Bible into French by his cousin Olivetan. His second work is a summary of the Christian faith : The institutes of the Christian faith (1536). It was the first edition in Latin of his most important work which – throughout his life – he kept reorganising and expanding. Geneva: gates in the lower part of the city © S.H.P.F. Had it not been for the providential intervention of fate, Calvin could have pursued his brilliant intellectual career as a thinker. He wished to go to Strasburg. The direct route was closed on account of the wars. He was obliged to go through Geneva which had just adhered to the Reformation under the influence of the Reformer Guillaume Farel. When the latter heard that Calvin was in Geneva, he immediately thought that Calvin, author of the Institutes of the Christian Religion, was the ideal person to help him in the task of structuring the Reformation in Geneva. He sent him an urgent call. Calvin remained in Geneva and, even though it was no easy task, he endeavoured to put his ideas into practice. Calvin and Farel did not agree with the town government about the respective powers of the Church and State, especially concerning religious matters. They did not have the final say and were expelled by the town authorities in 1538. At the request of the reformer Martin Bucer, Calvin settled in Strasburg. There the three most pleasant years of his life were awaiting him. He worked both as a pastor and a teacher. He met numerous intellectuals. He married a young widow, Idelette de Bure. She gave him a son who died when still an infant. Bucer had a decisive influence on the thought of Calvin, yet the latter did not hesitate to criticize him. In 1540, twenty years after Luther, Calvin drafted his Commentary of the Epistle to the Romans. He clearly demonstrated how far he stood from Luther : there is no absolute opposition between law and Gospel. In 1541, he published his Short treatise on the Lord’s Supper in which work he defined a midway position between the irreconcilable views of Luther and of Zwingli. That same year, the first French edition of the Institutes of the Christian Religion appeared ; it was an expanded version of the 1536 edition. Calvin received international recognition in Strasburg. With Bucer he attended several conferences organised by Charles the Fifth in order to attempt bridging the gap between the Churches. On such an occasion, he met Melanchthon and befriended him. Despite Bucer’s moderation and Melanchthon’s sharpness, none of these conferences were successful. In 1540, a majority of the Geneva city council members was favourable to Calvin’s return. He was urged to come back on two occasions : in 1540 and in January 1541. He was not to return until September 1541, convinced that he would stay no more than six months. He stayed twenty-three years, until the end of his life. Over the first six months, he introduced three texts which structured the Church : The clerical ordinances, The catechism, The usage of prayers. The latter was a book liturgy. He instituted the singing the psalms – versified by Clément Marot – during the church service. The following year, he welcomed Marot to Geneva. Geneva calls to mind the name of Calvin, and yet he often felt ill at ease there. He was considered a foreigner to the city until 1559 when he was granted the status of townsman. Until 1555, he had to face the hostility of the town councils which often regarded him as a dictator. In fact, he was never favourable to political power being under the influence of the Church. Back in Geneva, Calvin resumed preaching. He delivered two sermons every Sunday and, every other week, he preached daily from a chosen book of the Bible. His numerous students took during his preaching but only fragments are still available. Unlike Luther, Calvin was suspicious of medieval Bible reading methods (allegorical and typological). He applied to biblical texts reading techniques used for secular texts. He particularly denounced the confusion between literal and figurative significance. For example, when during his last supper Jesus spoke the words « this is my flesh, this is my blood… », for Calvin the bread and the wine are a figure of speech, an image. They represent Christ but are not Christ. In the same way, in the Bible, the dove represents the Holy Spirit but is not the Holy Spirit. As early as 1541, Calvin translated The Institutes of the Christian Religion into French. This is one of the first books of systematic theology to be translated into French. With this translation, Calvin contributed to establishing of the French language, still evolving at that time. Calvin’s writings in French were very numerous : Bible commentaries, theological texts, letters, etc. He was one of the most prolific French writers of the XVIth century. The Spaniard Michel Servet was persecuted both by the Roman Catholic Church and the Reformers for his anti-Trinitarian treatises. He considered the doctrine of the Holy Trinity as out of keeping with the Bible and, consequently, as heretical. 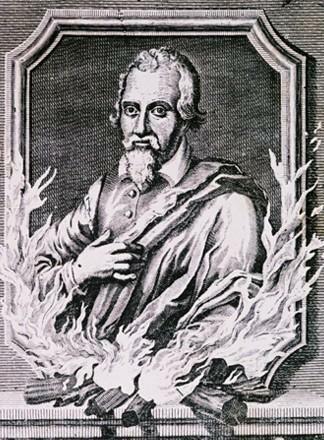 Michel Servet was arrested in Geneva and was burned after having been tried and sentenced for heresy on October 27, 1553. His execution began a controversy between Calvin and Sebastien Castellion, who defended religious tolerance. 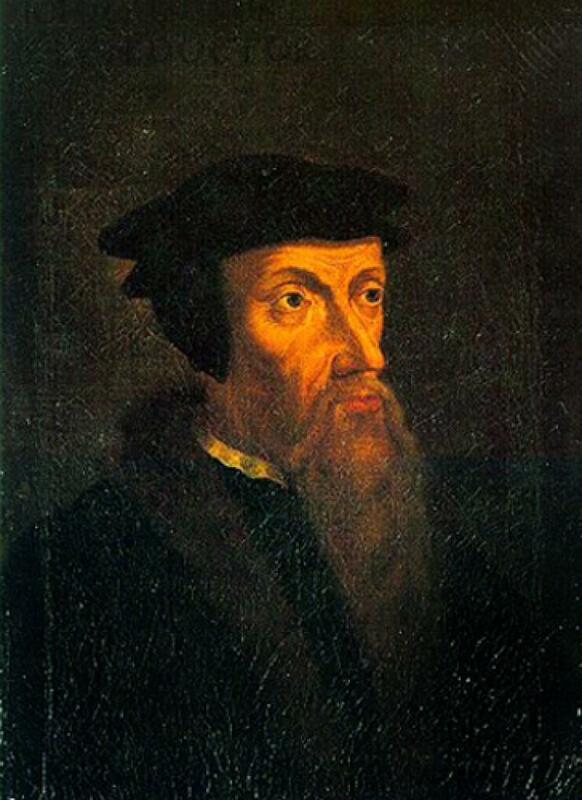 While in exile, Calvin was concerned about France and about those who had adhered to the Reformation. Fearing persecution, the latter lived their faith secretly while attending Roman Catholic church ceremonies. Calvin denounced this as hypocrisy and urged his fellow citizens to escape to countries that had adopted the ideas of the Reformation (Apology to the Nicomenides, 1544). They crowded into Geneva whose population doubled between 1545 and 1560. They brought Calvin valuable support. 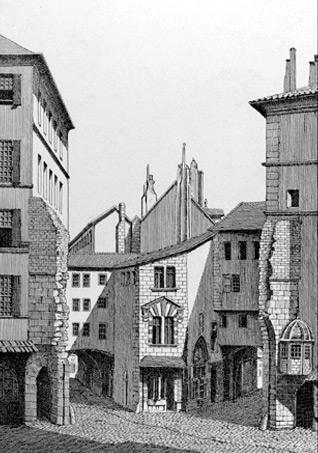 From 1555 on, a number of Reformed churches were opened in France. From then on, Calvin urged the French Protestants to stay in their country. He encouraged them with his advice and sent them pastors who had been trained in the Geneva Academy. For the first synod in Paris in 1559, he sent them the draft of a confession of faith and a proposition of church discipline. Later, he sent them numerous pastoral letters. 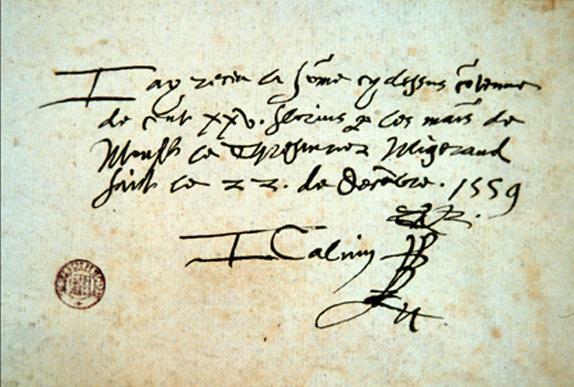 The creation of an Academy in 1559 contributed to the reputation of Geneva. The theological teaching provided put the emphasis on the study and interpretation of the Holy Scriptures. The Academy of Geneva was headed by the Frenchman Théodore de Bèze and, thanks to the quality of its teachers, it became very influential. 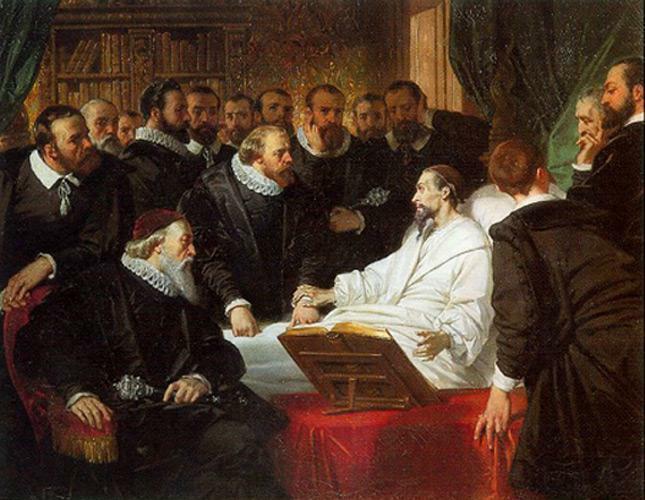 As from 1555, Calvin’s authority remained undisputed in Geneva. The Geneva model spread all over Europe. In 1559, Calvin drafted the final version of The Institutes of the Christian Religion, which consisted of four books and eighty chapters. He wrote many treatises (against the Anabaptists, against licentiousness, astrology, relics etc.). He gave public lectures at the newly-founded Academy of Geneva and organised a continuous commentary of the books of the Bible. His health was poor, and such hard and strenuous work wore him out. He died on May 27, 1564 at the age of fifty-five. Théodore de Bèze continued his work.